February | 2012 | ARChive of Contemporary Music, or "Would You Take My Mind Out for a Walk"
ARCsters recently attended the opening, book signing and reading at the swell Ed Sanders gallery show at Boo-Hooray Gallery on Canal Street. Ed was kind enough to sign a copy of his new book, Fug You, (here’s a good review from the times) and two of our albums. The reading centered on his obscenity arrest and trying to avoid getting the judge who sentenced Lenny Bruce. Street pretzels and mustard were served. We were a little surprised to see that one cover that we had signed was shot by society photographer Richard Avedon. Seemed the antithesis of what the Fugs were up to. Then an industry insider told us that a ‘certain exec’ at Reprise/Warner Bros. used big name photographers like Avedon just to say they owned a print by Avedon. My guess is that the cost was a chargeback to the artists! The show was put together by avid collector and impresario Johan Kugelberg, who was kind enough to offer to help us track down the recordings we are missing. • Fugs First Album, The (ESP, 1018, 12″, 33.3, LP, 1965). Black + white photo on cover. Black text label. • Fugs First Album, The (ESP, 1018, 12″, 33.3, LP, 1965). Black + white photo on cover. “Reissue of Broadside BR 304″ on front cover. Riverside Dr. address on label. • Fugs First Album, The (ESP, 1018, 12″, 33.3, LP, 1965). Black + white photo on cover. Orange custom label. • Fugs First Album, The (ESP, 1018, 12″, 33.3, LP, 1965). Color painying on cover. . Orange custom label. • Fugs, The (ESP, 1028, 12”, 33.3, LP, 1966). Black + white photo on cover. STEREO “stereo” sticker on cover. Three photos along top of back cover. • Fugs, The (ESP, 1028, 12″, 33.3, LP, 1966). Black + white cover. STEREO “stereo” on back cover. Three photos along top of back cover. • Fugs, The (ESP, 1028, 12″, 33.3, LP, 1966). –. COLOR COVER “STEREO” on upper right corner of back cover. • Fugs, The (ESP, 1028, 12″, 33.3, LP, 1966). –. COLOR COVER “STEREO” on left side of back cover. • The Fugs Second Album (Fugs, FCD-9669-2, 5″, -, CD, 1993). . Reissue of 1967 album with 5 bonus tracks. • Golden Filth – Alive at the Filmore East (Edsel, UK, ED 217, 12″, 33.3, LP, ). 5014757132179. Eighties British reissue of 1970 LP. • It Crawled Into My Hand, Honest (Reprise, 6305, 12″, 33.3, LP, n.d.). • Proto Punk; The Fugs Greatest Hits Vol. I (PVC / ARI, PVC 8914 / AD 4116, 12″, 33.3, LP, 1982). Compilation of ESP recordings. • Star Peace: a Musical Drama in Three Acts (New Rose, France, ROSE 115, 12″, 33.3, LP, 1987). 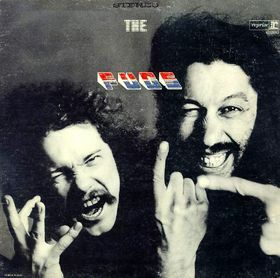 The Fugs / Firesign Theatre . Sampler (Artemis, 197, 5″, , , 2003). Advance promo in generic package, no cover. • Songs From a Portable Forest (Gazell, GPCD 2003, 5″, CD, 2003). • Tenderness Junction (Reprise, 6280, 12″, 33.3, LP, n.d.). Richard Avedon photo on cover. Autographed. 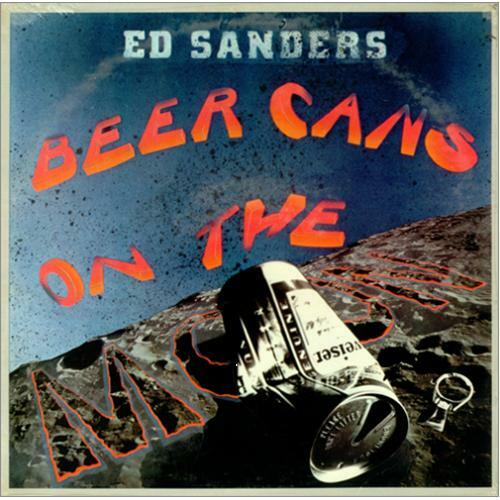 • Beer Cans On the Moon (Reprise, MS 2105, 12″, 33.3, LP, 1972). White label promo. M-. Autographed front cover. • Poems for New Orleans (Paris, 2007, 5″, -, CD, 2007). 7 33792 77102 4. 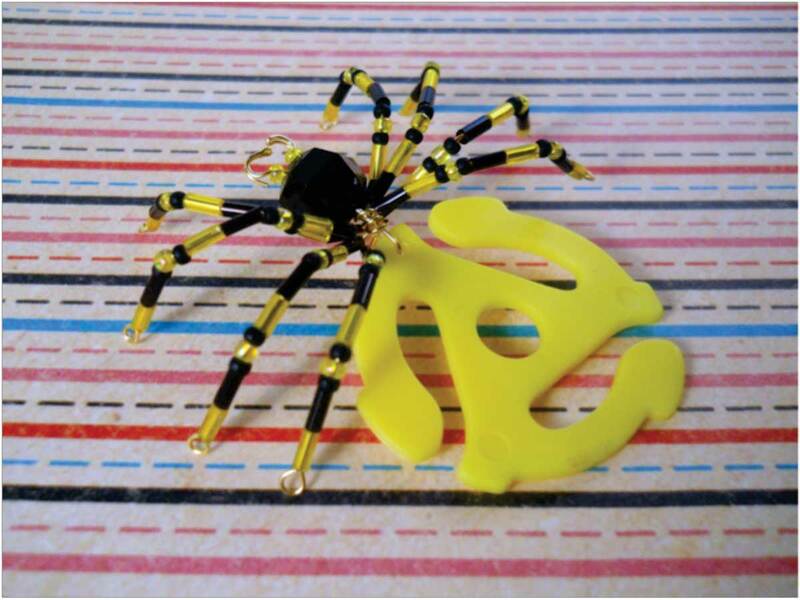 45 Spiders is also the name of a neo-punk band and the above bit of frippery from Atomic Rose. 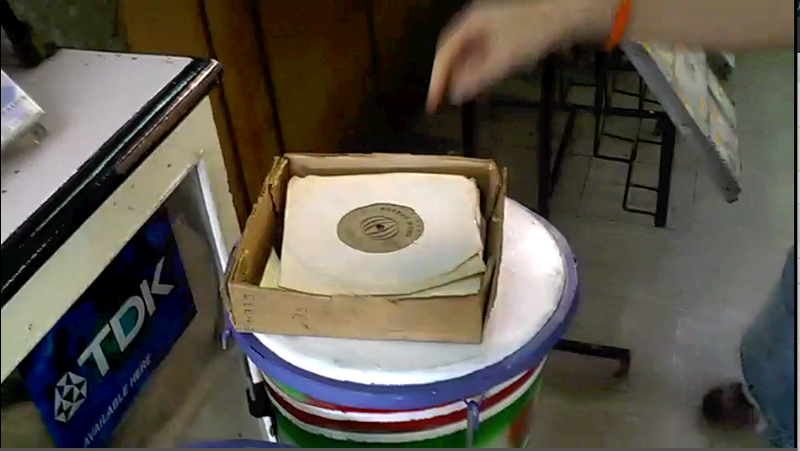 This just in from our travelin’ pals visiting Melodica Record Store, Nairobi, Kenya. Looks like downtown anywhere (go to film). Well anywhere where cassettes are still king. This still at the end is the gold, finger pointing to the surround sound for some lucky spiders. It’s a trip I could have been on, but passed. I’m stupid.